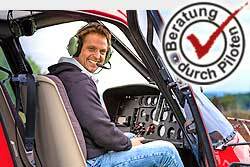 Control of the helicopter and the behavior of the aircraft. Providing basic knowledge in the areas of navigation, flight training, aerodynamics, weather and practical instruction in the control and handling of the helicopter. Flight planning with calculation of flight path to a flight destination approx. 30 minutes away. Monday to Friday bookings (Mo-SA flyable), times are pure flight time (turn on/off the motor). Incl. T-shirt printed with "pilot".